I love quick breads. The tender crumb and sweet flavor leave me thinking “just one more piece.” I usually make zucchini bread and pumpkin bread throughout the late summer and winter. This year we haven’t been getting much zucchini; instead, we are getting boat loads of patty pan squash. I found this summer squash bread recipe on pinterest and knew it would be the perfect trial run for patty pan squash bread. I never used to make dishes with lemon – sweet dishes were always cinnamon-spiced or chocolate. A few years ago my naive palate found a delicious poppy seed lemon cake and I was hooked instantly. 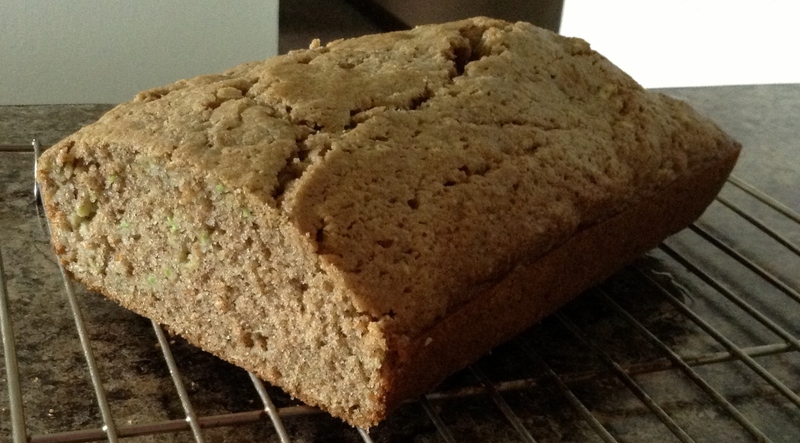 Few things are as delicious as freshly baked lemon quick bread. I hope you enjoy this wonderful treat! Note: I did not make the lemon crunch glaze but you can visit the link above if you’d like to add it. Preheat oven to 350F. Spray 2 loaf pans with nonstick cooking spray and set aside. In a medium bowl, combine flours, baking powder, baking soda, salt, and spices. In a large bowl, combine eggs, sugar, and olive oil. Beat well on medium speed until light and fluffy (about 3 minutes). Add lemon extract and mix until incorporated. Add the dry ingredients while beating on low. Once combined, increase to medium speed and mix for 30 seconds. Mix in grated squash until combined. Divide between the 2 prepared pans. Bake for 30-40 minutes, or until the top begins to crack and the sides pull away. Remove from baking pan after 5 minutes of cooling and move to a cooling rack. The loaf is very moist with patty pan squash, so I stored it in the refrigerator after a day. Since it makes 2 loaves, I recommend wrapping one in plastic cling wrap and putting it into a freezer bag. Store in the freezer for up to a few months. Strangely, I have never liked banana bread. It seems everyone in nutrition LOVES banana bread, so I set out to find a recipe that I could attempt to enjoy. I got lucky this past spring when I stumbled across the recipe at The Kitchen Sink Recipes. This recipe is so good that I didn’t even have to try to make myself like it – I loved every last bite of it and then made some more! It is sweet, but not overally sweet and is extremely moist. I don’t have a picture of the bread, but once I make another loaf I will update this post with a picture. You can also refer to the link above for a peak. *If you can’t find this, you can do half white, half wheat, or all wheat. If you do all whole wheat, you may need to cover the pan with tin foil and cook for any extra 15-30 minutes. 1. Preheat oven to 350F and spray loaf pan. 2. Cream butter and sugar in a large bowl together until light and fluffy. 3. Whist together mashed bananas, egg whites, buttermilk, yogurt, and vanilla in a small bowl. 4. Whisk the remaining dry ingredients into a small bowl. 4. Alternating between bowls, add the contents of the banana bowl and flour bowl into the sugar. Be sure to mix between additions on low. 5. Mix until just combined…do not over mix. 6. Pour into the loaf pan and bake 50-60 minutes. As for posting for the next few weeks…they will be few and far between, but I will try to keep up with it! Combine flours and all of the dry ingredients except the sugar into a medium bowl. Place the sugar, egg whites or egg substitute, oil, buttermilk and eggs in to a large bowl and beat with a mixed on high until well blended. Add 2/3 cup of water and pumpkin, beating on low speed until blended. Add flour to the mixture, beating on low speed just until combined. Spoon batter into 2 9×5″ loaf pans coated with cooking spray. Sprinkle with pecans and bake at 350F for 1 hour, or until wooden pick inserted comes out clean. Cool 10 minutes in pans on a wire rack; remove from pan and cool completely on wire rack.